want to break the hold this habit has over you? If you don’t want to stop smoking but have been told to by a doctor then I’m afraid hypnotherapy won’t help you. If you’ve made the decision to stop, this helps any barriers left. Many people each day give up smoking without any aids, showing it can be done, it just depends on how much you want to give up, and what you are prepared to put up with. Most who give up without any aids say they just need to be more careful in certain situations. Being mindful of the times you’re most vulnerable certainly helps, and you can avoid the situations. The latest research in the States, reported in the American Journal of Medicine has shown hypnotherapy has it’s place in the toolkit for smoking cessation. They report that it works just as well as medication and can be used as an alternative for those who do not want to take medications. The part of the brain that promotes the smoking is also responsible for negative emotions, so someone highly stressed or has problems dealing with emotional issues may turn to smoking as a way to help calm them down. Unfortunately, it does the opposite. Smoking will create high blood pressure as the body thinks it’s in danger and turns on the fight or flight mechanism. If you have tried giving up many times then looking at your lifestyle and stress levels will certainly help. When you look closer at methods of giving up, many of them include drugs of some description, and this could give us some idea of who is behind the argument that hypnotherapy is ineffective. The amount of money generated in gums, drugs, patches is huge, compared to those who spend one or two sessions in hypnotherapy. No wonder they don’t want you to know how effective hypnosis can be. How many sessions will I need to stop smoking? Many hypnotherapists work from a one-off 2-hour session. However, I have found that is more effective if the person has had hypnotherapy before. Anyone who is a bit nervous, I find doing 1-hour consultation and relaxation, followed a week later by the stop smoking is more effective as people take time to get used to being in the trance state. If someone is smoking more than 5 cigarettes a day then I may ask for a longer duration. Please bear this in mind when you come to book a stop smoking session. I have had clients from all over the UK, and Europe come for Stop Smoking sessions. The furthest was Poland, and two years after she gave up, my client’s husband decided to fly over and see me. Many people don’t like the idea of giving up smoking because they believe that they will gain weight. Recent research has found that this happens not because people replace one habit with another, but because of the gut flora changes in someone who gives up smoking. 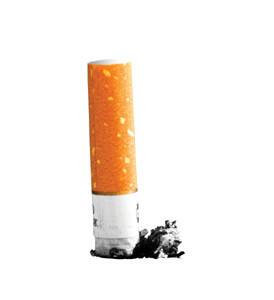 The way of getting around this is to make sure when you decide to give up smoking to slowly reduce the amount so you’ve cut it back to no more than 5 a day, and you increase your intake of healthy fruit and vegetables and maybe probiotic yogurt, so when you do quit your body is better prepared. Dave (not his real name) came to see me to stop smoking. He admitted he smoked most when he was at his most stressed out. I asked him how stressed he was at the moment and he was very stressed. His wife had told him he had to stop or she would leave him. This, of course, would send anyone’s stress levels sky high. The other source of stress was his work, he was in charge of a department, but his work meant he was out of the office most of the time, so when he came back into the office he had to catch up. The department was going through problems, everyone was grumpy, negative, there was a lack of motivation. When I asked him the question “If tonight when you go to bed a miracle happens, but because you were asleep you don’t know a miracle has happened, what would the first signs be at work, that something special has happened?”. From the answers, he gave it was quite evident that he needed to sort it out and soon. Furthermore, I suggested to him that I could help him coach his staff, so he agreed and for the next 3 weeks I taught him the Solution-focused approach. Over the next 3 weeks, he reported back to me that it was working. In addition, the mood in the office was much improved. He had offloaded some of his own work onto one of the admin staff, and everyone was doing a fairer share. We then worked with the SF approach in psychotherapy to improve his relationship with his wife. After a couple of sessions, he realised he had to stop being so selfish. The independence his wife was looking for came in the form of starting up her own business. Dave now realised how stressful this was for her. As a result he started to pay more attention and being more interested in her venture. Consequently, by week 6 Dave found he was much improved in his stress, so I carried out a stop smoking session. He stopped! Most noteworthy was that he was happier about his relationship and his work life. However, you need to sort out your lifestyle, relationships and job, as the level of stress can impact on your habits. 3) Elkins, Gary; Marcus, Joel; Bates, Jeff; Rajab, M. Hasan; Cook, Teresa. (Jul 2006). Intensive Hypnotherapy for Smoking Cessation: A Prospective Study. International Journal of Clinical and Experimental Hypnosis, Vol 54(3), 303-315.